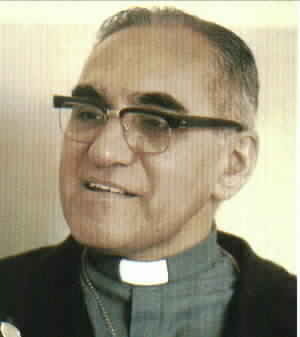 Oscar Romero spent most of his free time around the Church when he was a little boy. Sure, he was active among his friends and did all the things that little Salvadoran boys did but when he had a stretch of free time you were likely to find him down at one of the local church buildings. He had been raised in a Christian family--son to Santos Romero and Guadalupe de Jésus Galdámez--and received a limited education. His limited education was not because of lack of intelligence or priorities but because of a relative lack of need for education within El Salvador in the early twentieth century. Oscar's school, for example, only offered three years of education for its students. After that, a student would need to receive private tutoring if they were going to received further education.So, for the Salvadorans it was better to learn a skill or a trade than to receive an education and so Oscar learned carpentry from his father. Oscar showed some talent at carpentry but it did not prove to be the calling that was first and foremost upon his life. He did have receive private tutoring but academia was also not his primary calling. Instead, he became a priest in 1942and answered to a calling that had been brewing in his young mind on those lazy afternoons when he was likely to be found around the Church and its ministers. Oscar's ordination took place in Rome and he stayed a little while longer to continue his studies in theology. In 1943, however, things were becoming increasingly tense on the geopolitical scale and Oscar was summoned to return to El Salvador. When he finally made it home--he was held and detained occasionally because of his presence in Mussolini's Italy during World War II--he began to serve the Church as best he knew how. Eventually, this entailed becoming bishop and even archbishop in El Salvador. His appointment to these positions of power was not always well received because he was not fully invested in the liberation theology that was so popular in El Salvador at the time. Further, he seemed to have no Marxist leanings and Marxism was becoming more and more popular with the less politically conservative members of the priesthood in Latin America. Everything changed, though, when Oscar's friend Rutilio Grande was assassinated for advocating for the poor and politically undesirable. Oscar had been a friend of the poor for years but not the extent of Rutilio. With the deafening thunder of the machine guns that made a martyr of Rutilio, Oscar was awakened to the incredible struggle that was already going on in El Salvador. He would later explain that Rutilio's death impressed upon him that Rutilio's cause had been good and just. In other words, the martyrdom of Rutilio Grande convinced Oscar Romero that the poor and disenfranchised were worth dying for. As archbishop, he was called to shepherd the People of God and care for its ministers. When Oscar realized that both were being killed, he said,"When the church hearts the cry of the oppressed it cannot but denounce the social structures that give rise to and perpetuate the misery from which the cry arises." He wrote letters to Jimmy Carter--the President of the United States of America--asking that the United States stop sending money to the Salvadoran government because of the injustice that was being perpetrated with those funds. As he further invested himself in the life of the people he began to be questioned about why he would agree to do this since it likely meant he was signing his own death warrant. He responded, "I am bound, as a pastor, by divine command to give my life for those whom I love, and that is all Salvadorans, even those who are going to kill me." In 1980, he was officiating the Mass at a chapel and knew he was woefully under protected according to the security expectations of world leaders. Yet, he understood his calling to be a matter of commitment regardless of danger or potential cost. Just a few days before, he had told a reporter what it was he wanted to say to any who might be planning on killing him: "You can tell the people that if they succeed in killing me, that I forgive and bless those who do it. Hopefully, they will realize they are wasting their time. A bishop will die, but the church of God, which is the people, will never perish." As he lifted the bread during the Eucharist the doors at the back of the chapel were flung open and gunfire was heard. A single bullet hit Oscar in the heart as he lifted the bread above his head and spoke of a God who loved the world--the poor and the rich, the powerful and the hopeless--enough to die for it. He had been executed by one of the governing body's death squads. At his funeral, they threw bombs into the crowd--numbering nearly 250,000--and snipers fired into the panicked masses. The struggle was not over but Oscar had played his part well and with passion. He died a martyr and drew the attention of world leaders who began to suspect that something wasn't right in El Salvador. He purchased this attention with his blood.